My guest on this week’s podcast is Sarah Fogle from The Ugly Duckling House. Part story-teller, part DIY tutor, Sarah shares her experiences, successes and challenges in fixing up a house that suffered from 20 years of neglect. She uses her site as a running log of knowledge that she has gained in the hopes that it will help others with their own DIY. One person’s definition of “move-in ready” is not necessarily the same as another person’s definition. Sarah’s childhood experience helping her father: there is no such thing as “can’t”. How her background in crafting helped her with larger home improvement projects. 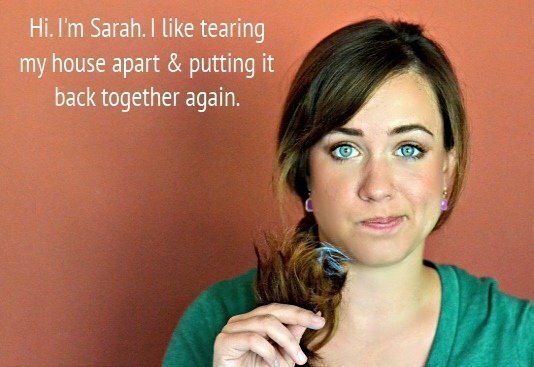 How Sarah approaches teaching DIY. How the power of social media can be harnessed to define a brand. Amy Poehler’s Smart Girls: Smart Girls seeks to help future women channel their intelligence, imagination, and curiosity into a drive to be their weird and wonderful selves. Girls Who Code: Girls Who Code seeks to close the gender gap in technology, inspiring girls to pursue computer science by exposing them to real life and on screen role models. DIY Diva: Kit is an experienced DIYer, admitted power tool junkie, and accidental farmer who has spent the last decade tearing houses apart, putting them back together again, and writing about it on her website. Where are the Real Makita Girls? : Brittany from PrettyHandyGirl.com calls out Makita for their choice of spokesmodels. Charlie: Sarah mentions Charlie towards the end of the interview. Here is a direct link to Charlie’s page on her website. There is more than one way to do something. Arm yourself with as much knowledge as possible to figure out the best way for you to tackle your project.